My ’67 sunroof was produced on December 20th 1966. It left Germany for California on December 22nd. I found the car in my hometown of Cumberland, RI in 1996. I finally got to own it in 2001. It had Berkeley University Faculty parking permits plastered across the rear bumper (which now hangs in my garage) dating from 1967 through 1983. The California DMV had no records for the car after 1983. It’s still a mystery to me how the car came to Rhode Island. It has a Mexico Tourist decal from December 1967 and a parking permit sticker for the Claremont Hotel in Berkeley on its rear window. 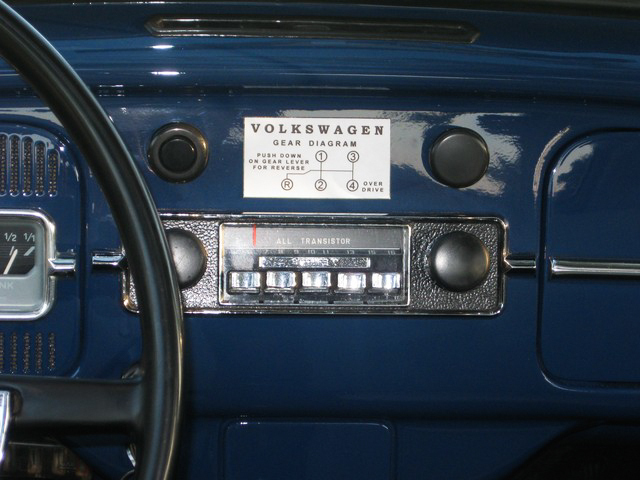 The car has its original engine and transaxle and pop-out windows according to the birth certificate from VW in Germany. I started a restoration on my first ’67 sunroof in 1995. The car was a New England car and very rusty. I started accumulating 67 parts then. In April 2001 I bought this ’67 sunroof. A California car that was very solid but basically a shell with a motor. Between the 2 cars and parts I had gathered since ’95, I had enough for the restoration. It was finally finished, I hope, in 2011 so a good 15 years. Trying to find the best aftermarket parts when the originals aren’t available. Luckily new items are always being produced and improvements of other items are being made also. Having to cut a hole into my painstakingly installed headliner for the sunroof. Adjusting the sunroof without scratching the paint. All of the one year only parts. VW only changed something to improve upon it it in those years so every model year would have a couple of different things. The ’67 by far has the most one year only parts. There are also early, mid and late production ’67’s and they have different variations of the parts. For example the seats, door lock knobs, the rear bumper over riders and the SB-12 headlight rings. 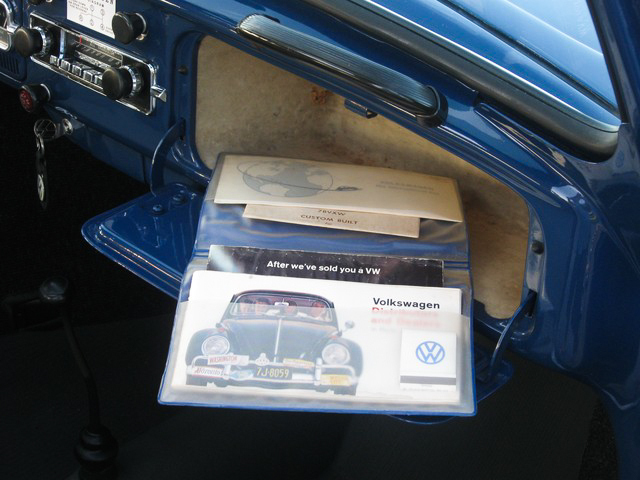 These are just a few of the items that are different depending on when a ’67 beetle was produced. It is also the easiest year to identify by just looking at the headlights and the front bumper. From what I’ve read on the Samba, the plastic clips attached to the B pillar that hold the seat belts back. The metal bracket that secures the air cleaner to the carb and intake. Finally the elusive plastic dust cover for the engine lid lock mechanism. Luckily between the two ’67’s I had these items. You should do the restoration that you want to do and what fits your budget. My restoration never started as a concourse show vehicle, but it evolved into that. Now I’m afraid to leave it out of my sight, but I’m still not afraid to drive it. I think a stock vehicle will always fetch a higher resale price. 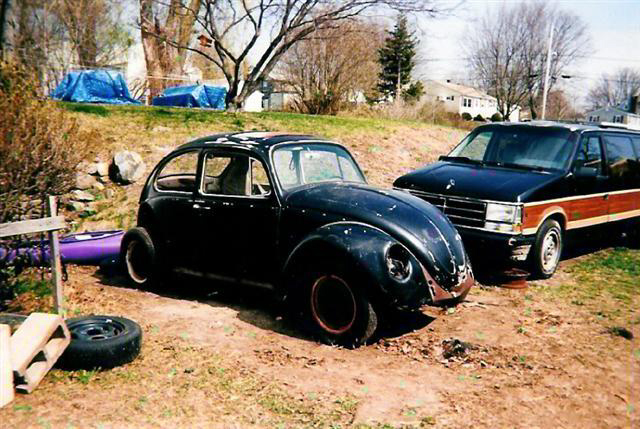 What advice would you give to anyone restoring a ’67 Beetle? If your going for a stock restoration, research, read and learn. There is a wealth of knowledge on the Samba. There are a few guys that are very knowledgeable to ’67 only specs. My screen name is 1-4-3-2. Don’t be afraid to ask questions and make sure you have most of your parts available before you start. There are good quality items being produced now because the hobby is growing so fast. Things I wished I could have bought ten years ago. Enjoy your ’67 in whatever state it’s in, daily driver to trailer queen. Don’t let others discouraged your car or the restoration. Trust me, the time and money I’ve invested in my car was for me. It’s not perfect. Remember, it’s not 1967 and I didn’t just pick it up from the dealer. Do the best with the parts and resources available to you. Enjoy what you have and you’ll always be happy. 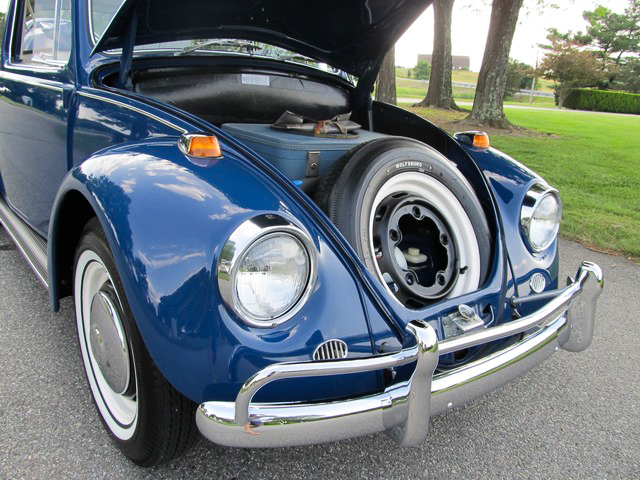 Thanks Jody for sharing your story with 1967beetle.com. 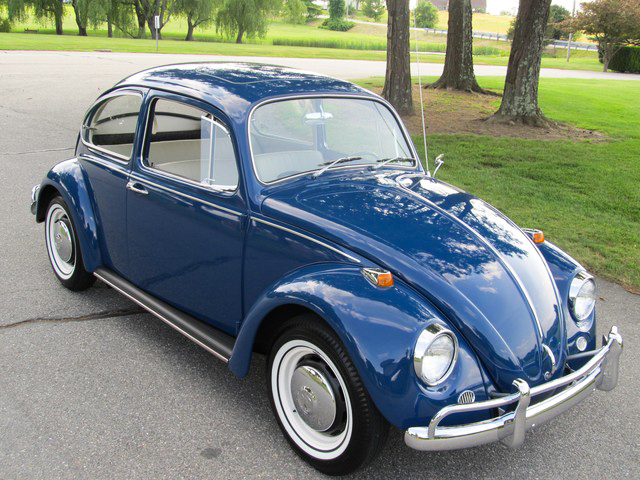 Do you own a ’67 VW Beetle that is properly restored or mostly original? Interested in having your ’67 pride and joy featured? Please email. A beauty! I have the exact car at my shop, just not a sunroof. I think I have seen this car at the Litchfield Bug in? Beautiful! This prods me to get started on my 67, changing it from Southern Appalachian yard sculpture, (as the wife calls it), to something I can put on the road.Thanks for the write up on your ride. What a great restoration! I think I’ve seen some of your posts on thesamba. You sure know your ’67’s! You’re username is 1-4-3-2? 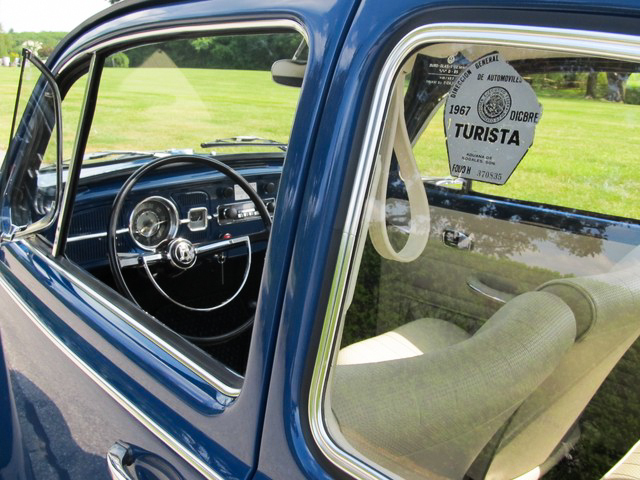 Really nice resto on the your 67 sunroof Beetle. I have a restored Java Green Sunroof. I have owned it since 1969 and have restored it twice. 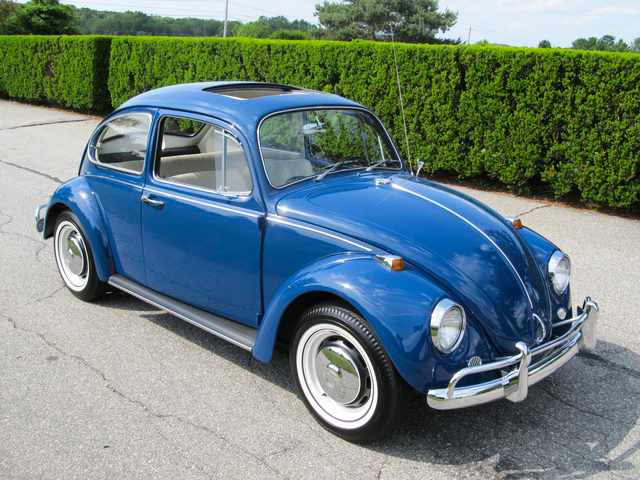 Proposition: I my VW experience, I believe the 1967 Sunroof Beetle to be as rare, if not more so, then the 1967 convertible. Here’s why: Volkswagen most likely produced more 1967 Sunroof models then the 1967 convertible (produced by Karmann), but not a lot more. 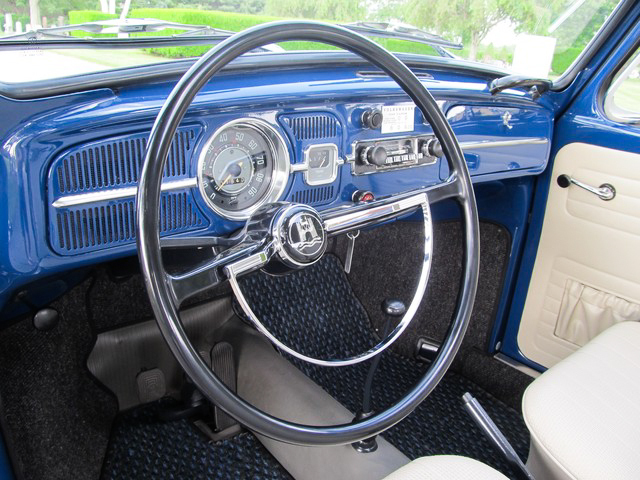 The 1967 convertible over the years has become a much more desirable collector item, and consequently retained, while the Sunroof model, over the years, was not much more desirable then the 1967 sedan. Indeed, many people avoided the sunroof model because they leaked if not maintained. Further, as rare as the 1967 convertible is, I actually see more of them then the 1967 sunroof over the past 35 years at shows, club events and on-the-road in general. 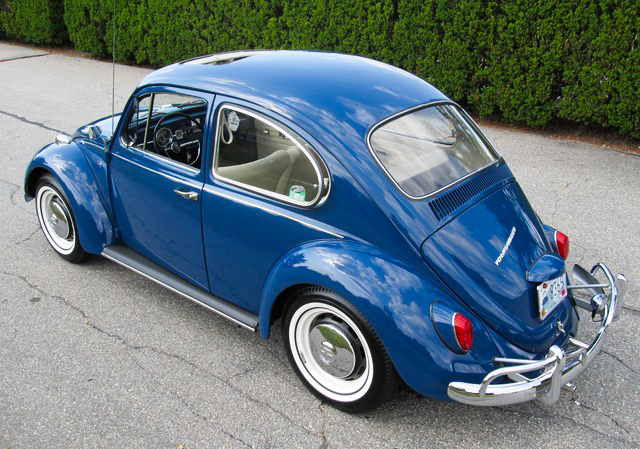 Ever notice the 1967 Beetle has sort of a tail sag after many years? All three of mine have it. My guess is it has more to do with rear torsion Z-bar suspension softening then weak shocks. 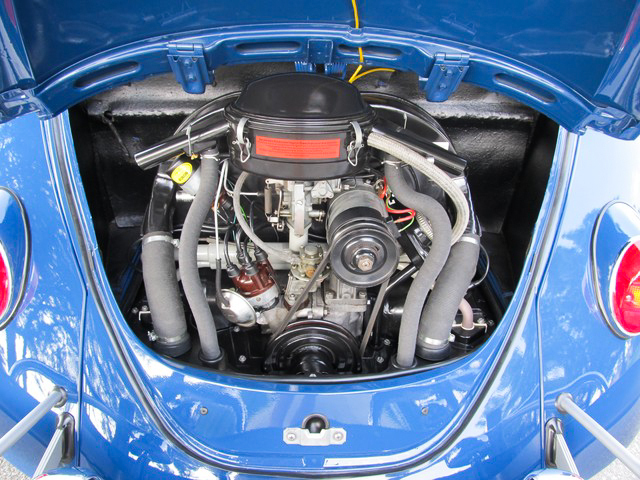 1967 Squat also appears on 1968 Beetles which also used the Z-bar rear suspension. 1969 went to IRS. 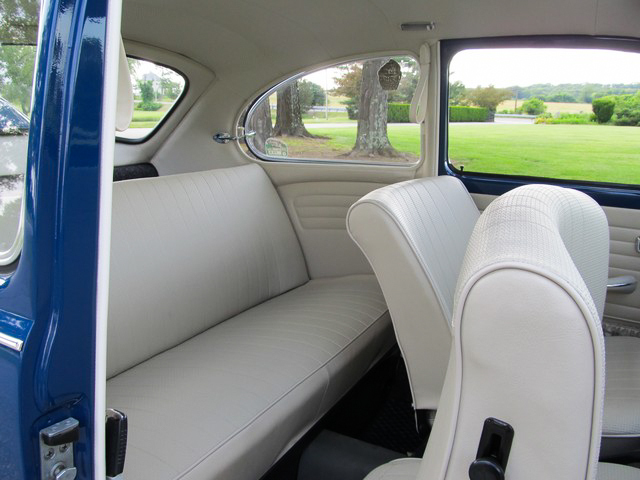 The 1965-7 Beetle with both a metal sunroof (sliding roof) and popout rear quarter windows (throwout windows) was referred to as “The Fresh air package” by the dealers. The metal sunroof was a $125 option and the “Throwout” rear windows were a $65–$75 option depending on the dealer. 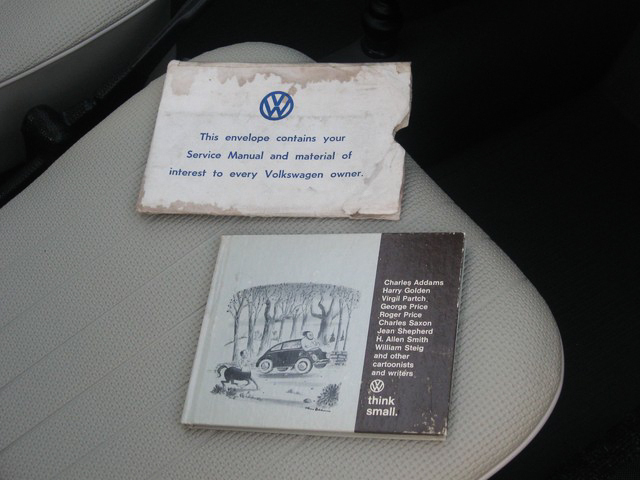 There are three different versions of the 1967 owners manual. 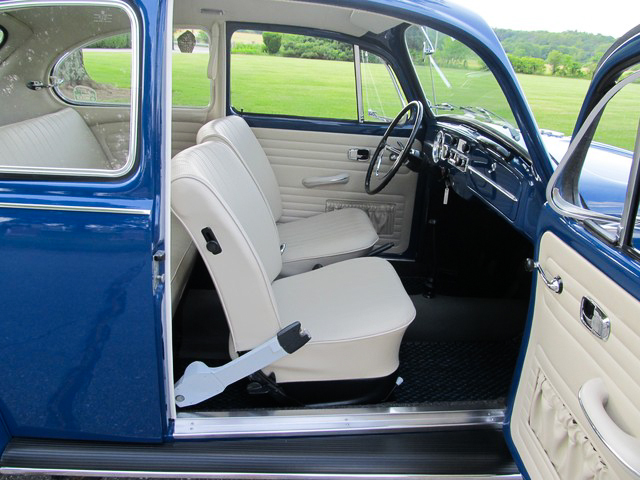 One of them specifically shows the operation of the rear popout windows and another shows the seat back release knob position being moved up on the seat back on later 1967 models. You are so very correct that both the Convertibles and the Sunroof Editions are quite rare! As you have seen from the World Production Records, not all of these two models reached the USA. WPR for the Convertible was 7,597 with 6,349 of these destined for USA consumption. According to an exhaustive “scrappage” study which I read on the subject, the result 47 years later puts something fewer than 1% restored ’67 ‘Verts in the USA. Note–the study is talking about restored to factory condition. You posit that even fewer restored SunRoof Models are existing–I have been saying this for the last few years. I recently became friends with a person who has a nice ’65 SunRoof Beetle. I asked him if he knew just how rare his car is. He DID know, fortunately, and is treating it accordingly. The unfortunate part of the story is that many of these truly rare models are being modified beyond recovery–lost forever. Nice study that you are doing on the different versions of the Owner’s Manuals. It would be nice to have your facts/figures to go into the “changes for year ’67” article on 1967beetle.com. I’m sure that Eric is reading this. He’s a real bull-dog when it comes to ’67 factoids! Thanks for stimulating our Collective ’67 Minds, Jerry. You are so very correct that both the Convertibles and the Sunroof Editions are quite rare! As you have seen from the World Production Records, not all of these two models reached the USA. WPR for the Convertible was 7,597 with 6,349 of these destined for USA consumption. 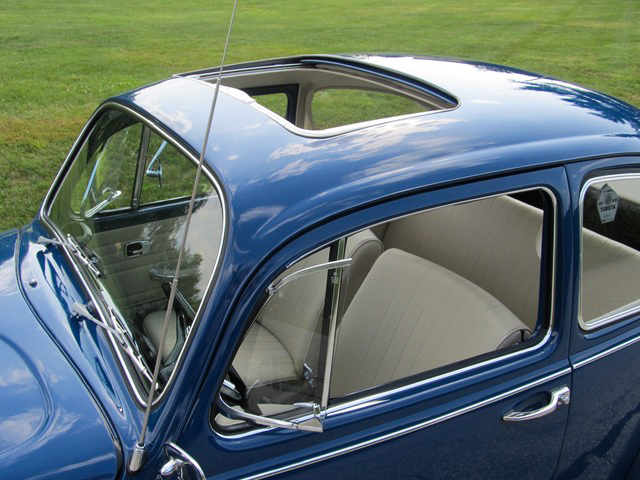 Your post that even fewer restored SunRoof Models are existing–I have been saying this for the last few years. I recently became friends with a person who has a nice ’65 SunRoof Beetle. I asked him if he knew just how rare his car is. He DID know, fortunately, and is treating it accordingly. The unfortunate part of the story is that many of these truly rare models are being modified beyond recovery–lost forever…..Yes, a damn shame. This has always been a sore point in my love for Beetles, how people mess them up. I called the optional quarter windows “throw-outs” for years, because the Owner’s Manuals refer to them just as that. Then, I joined the hip crowd calling them “pop-outs”. Sometimes it’s too difficult to buck the crowd. LOL….Porsche and Ghia owners also call them popouts along with most other sports cars, etc. Nice study that you are doing on the different versions of the Owner’s Manuals. 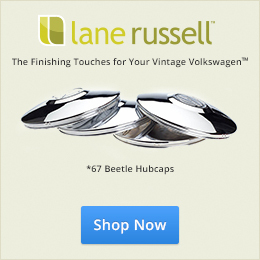 It would be nice to have your facts/figures to go into the “changes for year ’67″ article on 1967beetle.com. I’m sure that Eric is reading this. He’s a real bull-dog when it comes to ’67 factoids! This car is gorgeous!! If I’m not mistaken, was it on the Fall Foliage Cruise with the guys from ClassVWBug.com this past October? 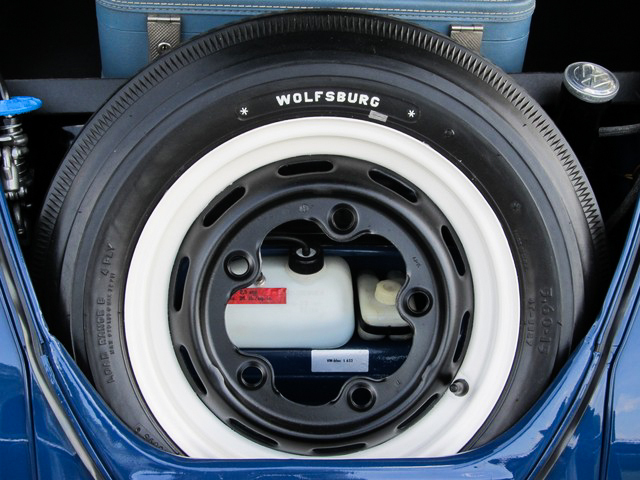 I remember a beauty of a 67 there with RI license plates… And I think I recall seeing the white “Wolfsburg” on the spare tire. Oh, and yes, I remember saying how much I liked the car and how jealous I was…LOL!!!! By far, one of the nicest 67’s I’ve seen.